Has the lawn and landscaping been neglected or does it simply need some TLC? Call the team at Gainesville Lawnscaping! At Gainesville Lawnscaping we take pride in our complete property lawn care maintenance throughout the Gainesville, Florida area. 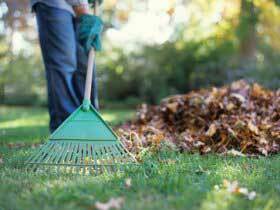 Our property clean up services can include leaf or pine needle removal, overgrown brush removal, landscape reshaping, and more. Regardless of how your property currently looks, it can be transformed into a beautiful landscape – and usually for much less than you would think! Click here to view some of the past transformations we have completed in and around Gainesville, Newberry, Alachua, and Archer. Contact Us Today For Exterior Property Clean Up Services In Gainesville! Whether you’re concerned about your neighborly reputation, the eyes of your HOA, or potential customers’ impression about your business, know that our exterior clean up services can help turn an ugly outdoor space into a true, inviting work of art. From pine needle and leaf removal to overgrown brush removal and landscape reshaping, Gainesville Lawnscaping can handle the job. Feel free to request a quote from our team or contact us directly to learn more!